When we had our second lady, the first lady was a few weeks past her second birthday. Her understanding of the impending situation was pretty good. I gathered advice and tips from friends and books on how best to go about introducing a toddler to a newborn. None of the below stopped me constantly worrying about how the whole thing would play out but it certainly did work when the second lady landed. To date, there has been little to no jealousy, apart from a little over zealous hugging and kissing, the girls are best of friends. 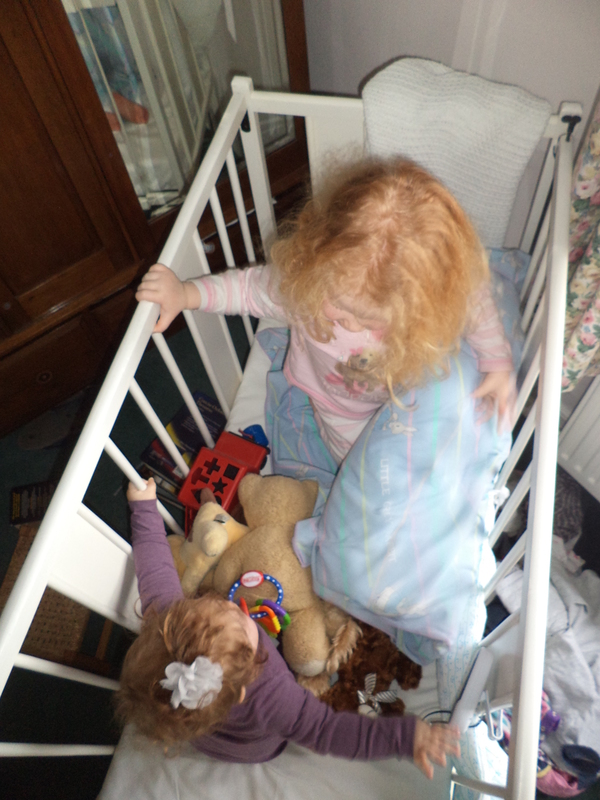 Baby not friend – we never left our toddler under the illusion that the baby would be a new friend for her to play with when it arrived. I’d been advised that this can sometimes lead to the toddler being really ticked off when the baby arrives and they can’t play lego or go on the trampoline. We began to sound like parrots that had lost our minds we repeated the word ‘gentle’ so many times. Independent thinking – towards the end of my pregnancy I was tired and my bump was huge (well she was 10 lbs 3oz when born at 39 weeks!). We taught the big lady to use the stairs by herself (under much supervision – I’m the world’s biggest worrier) and to get into the car seat herself purely because I didn’t have the the capacity to lift her constantly. Also, knowing I was going to have a section I didn’t want her to feel that the change in lifting her had come about directly because of the baby – instead we packaged it as a chance to be more independent and thankfully she bought it! First meeting – we brought the big lady into meet her new sister in the hospital. We thought it best they meet on neutral ground as opposed to the baby landing in on top of the toddler’s domain – this one is probably entirely dependent on your own toddler though. The big lady brought her new sister a little teddy in the shop to welcome her to the world and her little sister, amazing baby that she is, had been to Smyths toy shop to pick up a doll and a buggy to say thanks for the welcome. And chocolate – to this very day the big lady still talks about the baby buying her chocolate stars in the hospital and she (and we) are forever grateful for those chocolate stars! Routine – we stuck to the big lady’s routine as much as we could . Breakfast time with her daddy and evening time with us both remained largely the same for the first few weeks. Buckle carrier over double buggy – we invested in a buckle carrier (the Becco Gemini to be exact – suitable from birth until they your back begins to break with their weight) and this has been an absolute dream. It means my hands were (and still are almost a year later) free to hold the wild toddler’s hand and Cara is content being so close to me. FYI the carrier is also really handy for travelling, especially by plane. So save your money, don’t buy a double buggy if you don’t actually need it or the books and put it towards some wine, soft cheese and some shell fish so you can treat yourself once you’re done! Great tips. I am sure that it helped a lot. My two are almost 8 years apart so I did not need to worry about too much, but there was a bit of jealousy. Just about time. They were also different sexes and the big brother ended up falling in love with his baby sister. Great tips, we love slings over here too, not tried the Becco but we are massive Connecta fans, so so glad we didn’t invest in a double buggy because it would not have been used, we rarely even use the buggy now or the stroller. We have a very similar age gap and I could have written this post – a must-read for second time parents! Thanks for the lovely comment Georgina! I’ve heard great reviews on the Connecta too. Gosh yes toddlers do love to help, I must say I probably replied on peppa pig during those times which I had hoped not to but needs must! Great advice! Similar age gap here between no. 1 and no. 2. Totally agree that slings are your only man when going from one baby to two and beyond. Total lifesavers for school runs and supermarket trips.